Barbara Wiedner Barbara has been an inspiration to me for many years. I want to take this opportunity to review my recollections. Unfortunately my memory is not good, and my files are incomplete, but I want to tell you what I know. She grew up in Superior, Wisconsin, population 3500. From childhood she wrestled with her life’s ambitions: to become a nun (or a saint) or to have a dozen babies. She married at 19, had 10 children, has 20 plus grandchildren, and I don’t know how many great-grandchildren. She baked, cleaned house, washed and ironed with relish. Even as she did, she carefully watched the TV accounts of the Vietnam War and, in particular, the student protest marches and sit-ins. The death of her son, shot by a police officer, added to her political awakening. Barbara Wiedner (pronounced Weed-ner), 72, started her activism as a volunteer with the Catholic Worker. In March of 1982, troubled to learn that nuclear weapons were kept at Mather Air Force Base, she joined with others from Sacramento’s religious community in a weekly vigil at the Base entrance. Soon she was carrying a sign, made by her 10-year-old granddaughter, that identified her as a “Grandmother for Peace”. She balked when the idea of starting a peace group was presented to her. However, her first arrest on Good Friday, April 20, 1982, at Mather Air Force Base, changed her perspective. “As a mother and grandmother, I could no longer remain silent as our world rushes on its collision course with disaster which threatens the lives and futures of all children, everywhere, and the future of this beautiful planet itself,” said Barbara. In November of 1982, Barbara was invited to join 20 other American women on a 15-day peace journey that took them to Leningrad, Moscow, Minsk and Alma Ata. While in the latter, a city near the Chinese border, Barbara was asked to say a few words at a memorial ceremony for Leonid Brezhnev, the Soviet leader who had just died. Caught by surprise, Barbara spoke extemporaneously after 10 Russians had delivered prepared addresses. “I spoke to their grief,” she said. “I offered them my condolences. I cried through the whole thing. I cried a lot in that country. When I looked around at the Russian people, I asked myself, ‘This is the face of the enemy? These beautiful children and these wonderful women? And we’re planning to kill each other?’ I said that I prayed that their new leadership would work toward peace, and that somehow our two countries could work out something so that we could live in peace together.” The next day her talk was printed in Pravda. Another time, devout Catholic Barbara knelt in an Orthodox church to join a Russian grandmother in a prayer for peace. In April of 1984 Barbara and eleven others protested at Aerojet General Corp. in Rancho Cordova, California. Demonstrators strung clotheslines holding “peace pillowcases” designed by children before crossing the white line in front of gate No. 3 and being taken into custody for trespassing by Sacramento sheriff’s deputies. In another protest at Aerojet, on Good Friday, 1985, she was one of 70 who sang, prayed, read scripture passages and, while reciting the 14 “stations” of Christ’s death, held a ceremonial walk along the railroad tracks just outside the Rancho Cordova factory. When deputies moved to make their arrests after demonstrators crossed a white boundary line, the protesters did not resist. Fifteen were cited and given stiff sentences. The 90-minute demonstration meshed re-enactment portions of Christ’s crucifixion with the denunciation of nuclear arms. Aerojet-manufactured engines propel the Titan, Minuteman, Polaris, and small ICBMs, among other missiles. In August 1985, she was a delegate with Sacramento Mayor Anne Rudin to the first World Conference for Mayors for Peace Through Inter-City Solidarity, held in Hiroshima and Nagasaki during the 40th anniversary of the atomic bombing. The conference discussed the role of local elected officials in working for nuclear disarmament and the effect of the arms race on local and world economies. By 1986, she was already “a veteran” of hundreds of speaking engagements throughout the western United States, Minnesota, Wisconsin, Washington, D.C., Virginia, Massachusetts, Spain, Japan and the Soviet Union. 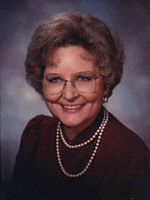 Respected for participating in civil disobedience actions at nuclear bases, weapons production facilities, and the Nevada Test Site, she was welcomed at universities, elementary and high schools, civic clubs, peace and social justice groups, churches, and women’s and seniors’ groups in the U.S. and abroad. 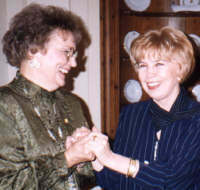 Barbara with Raisa Gorbachev In 1987, Barbara participated in The World Congress of Women in Moscow. The delegation received a 45-minute session with President Gorbachev. Then she met his wife, Raisa. “She asked to see me, and said ‘We’re two grandmothers, you know. Thank you for all your work on behalf of children all over the world.’” Barbara says that the fear of nuclear war is international among all the women she has met in her travels. On National Grandparents Day, September 13, 1987, Barbara was among 31 anti-nuclear protestors at the Nevada Test Site. They sat on boards supported by concrete blocks as they sang and told stories about their involvement with the peace movement. “We picked this site as a quiet place ... to pray, to meditate. We didn’t mean to provoke anybody.” After more than an hour of singing and storytelling near a culvert, the protesters formed a single line along a barbed wire fence that serves as the boundary marker for the 350 square mile site and began walking toward the cattle guard. It took less than 10 minutes for them to be arrested, put on two waiting vans and taken to the main gate where they were cited for trespassing. Fifteen days later, Barbara was awarded the Father Keith Kenny Peace Award by the Social Concerns Commission of the Roman Catholic Diocese of Sacramento. In January 1988, this globe-trotting activist led a delegation of Grandmothers for Peace at the “Women for Meaningful Summits” delegation at the Reagan/Gorbachev Summit in Moscow, this time meeting with both Mr. And Mrs. Gorbachev. On October 4, 1997 at Cape Canaveral, Barbara and I led the protest against the launch of the Cassini, a rocket headed for Saturn, carrying 72.3 pounds of plutonium. Deeply dimpled, bespectacled and always cheerful, she says she is blessed with her husband Bill, a soul-mate, an avid golfer and a delightful host, who cheerfully for many years has taken over her household chores. Their comfortable California home has one room dedicated to an office, but boxes of buttons, T-shirts and other GFP supplies spill over into closets and hallways. 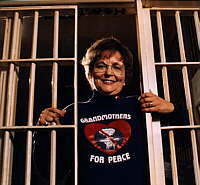 Officially started after Barbara’s first arrest in 1982, the organization today has Grandmothers for Peace chapters in almost every state in the USA, and in most countries that Barbara has visited — the Soviet Union (and also in Russia after the breakup of the Soviet Union), England, Finland, Netherlands, India, Japan, China, Jordan, Palestine, Israel, and I may have missed a few. Membership numbers are hard to define. “There are many roles for peacemakers and membership is not contingent upon paying dues, joining a chapter, or going to jail. What is important is that people who wear our buttons, or people who wear our T-shirts, consider themselves members.” And you don’t have to be a grandmother or even a woman to be a member, for the organization boasts an active Men’s Auxiliary. T-shirts, buttons, GFP stationary and other supplies nestle alongside Barbara’s knitting baskets and trunks (hope chests) filled with afghans, baby blankets, booties and sweaters lovingly made for the numerous grandchildren. Husband Bill has always been of incredible help, as father and grandfather, relieving Barbara of the cooking, toting bulk mailings to the post office, and hosting the many meetings. I’m glad to know that he is being helped now by Hospice. Thank you, Barbara, for your leadership. God bless you on your journey.